In 2 more months, the year 2017 will finally come to an end and we decided to do a Top 5 Best selfie Drones just for the sake of it. So, without further ado, here is our Top 5 Best selfie Drones, enjoy. The Wingsland S6 is the thinnest 4K drone available and is advertised as “the most powerful selfie drone on the market”. It carries a 4K-capable camera, can be operated by Gesture Control and even features Obstacle Avoidance. The quadcopter is priced similarly to the ZEROTECH Dobby and also comes in a compact package, with its four limbs folded up against the body. 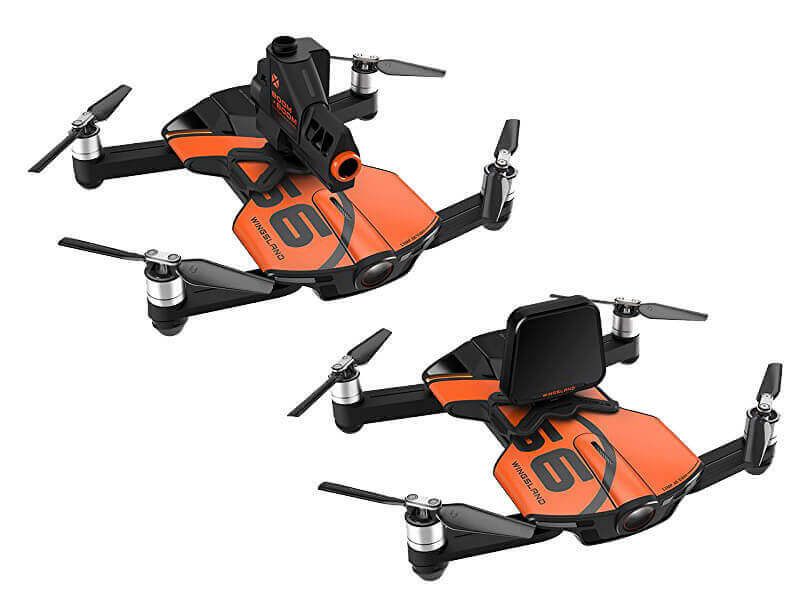 It is available in orange, yellow, blue or camouflage, giving it a unique feel compared to the other white and black quadcopters in the ‘selfie pocket drone’ category. With the Wingsland Fly app, the S6 can be controlled from your smartphone. The app gives you access to four different flying modes and also offers a simulator so that you can practice flying and getting used to the controls before really taking off with your S6. Once you have downloaded the app from either Google Play or the App Store, you will have access to various features. On the screen, you will be able to see your drone’s battery life, the number of satellite connections and strength of the signal. You will also be able to use the auto take-off and landing function or access settings, joystick control options, and the smart functions. It features 4 brushless motors capable of propelling the quadcopter at a speed of 8m/second. Beneath each limb, you will find a rubberized pad which acts as a shock absorber during landing. You can also customize your S6 by adding expression boards (words and symbols), searchlights or mini cannons to the top of the quadcopter body. This is one of the more advanced selfie drones in terms of its selfie-taking ability. It has a camera capable of recording 4K video and on the side of the lens, you will find a LED light which can be activated via the app, making low-light selfies possible. The quadcopter also houses a precision barometer which allows stable flight and hovering, keeping the camera still and reducing vibrations for clear dronies. There is also a “follow-me” feature whereby you don’t even need to be holding a controller to capture the shot. The Wingsland S6 RC selfie drone is a great option for those looking for a small drone for selfies with an excellent camera and some low-light capabilities. This is a mid-priced offering that is focused on recording footage and taking photographs rather than on actual drone flying or racing. You won’t be getting the functionality of a quadcopter with a more advanced, moving gimbal but then again you won’t be paying as much. The S6 is perfect for capturing selfies and short videos at a moment’s notice. 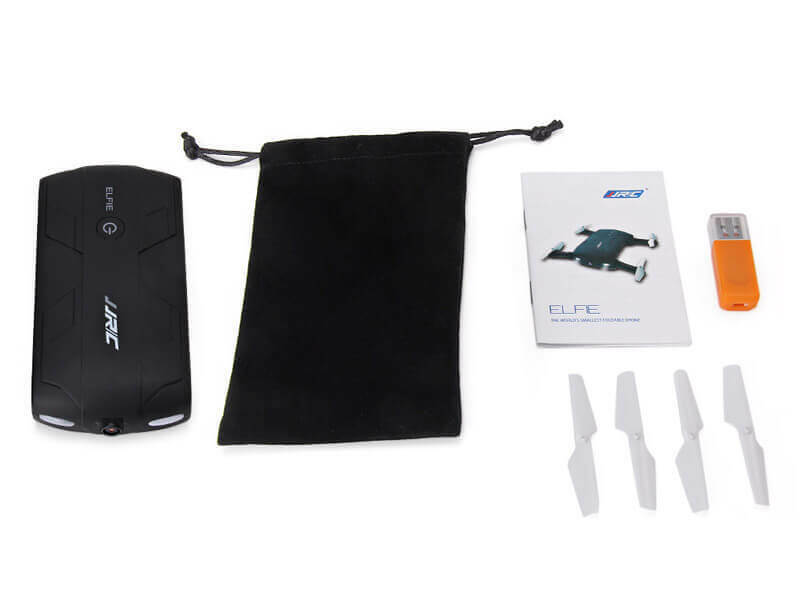 The JJRC H37 “Elfie” Drone is extremely similar to the EACHINE E50 Drone. Many of the features are exactly the same and this quadcopter also uses the WiFi UFO app discussed above. This is a black quadcopter that comes with white propellers and is accompanied by a small carry bag for easy insertion and extraction from your pocket. The JJRC Elfie seems to be a toy version of the Zerotech Dobby, but because it is so much cheaper, it may well be the perfect solution for those simply looking to take some aerial selfies. The Elfie drone features a headless mode, a G-Sensor mode, a one key take-off function as well as a one key return function. These different functions allow you to control Elfie according to your preferences, move him around using the virtual joysticks on-screen or even by simply tilting your phone in the direction you wish to send him. The quadcopter has LED lights on either side of the camera for low-light conditions, this also makes the quadcopter more visible for safety reasons. The JJRC Pocket Drone weighs in at less than 1 pound, making it extremely easy to take along with you and capture those selfies. 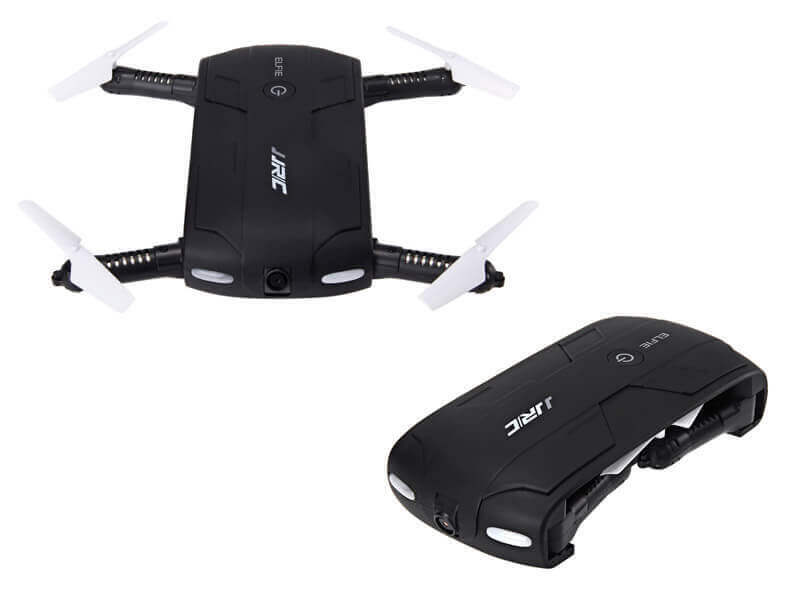 The JJRC Pocket Drone is an extremely affordable selfie sidekick. The charging time is quite lengthy, the picture quality isn’t perfect and the limited range is definitely a downside. However, if you are looking for a small drone that you can keep with you easily or travel with and your main aim is to use the quadcopter in close proximity, then the Elfie drone may be perfect for you. 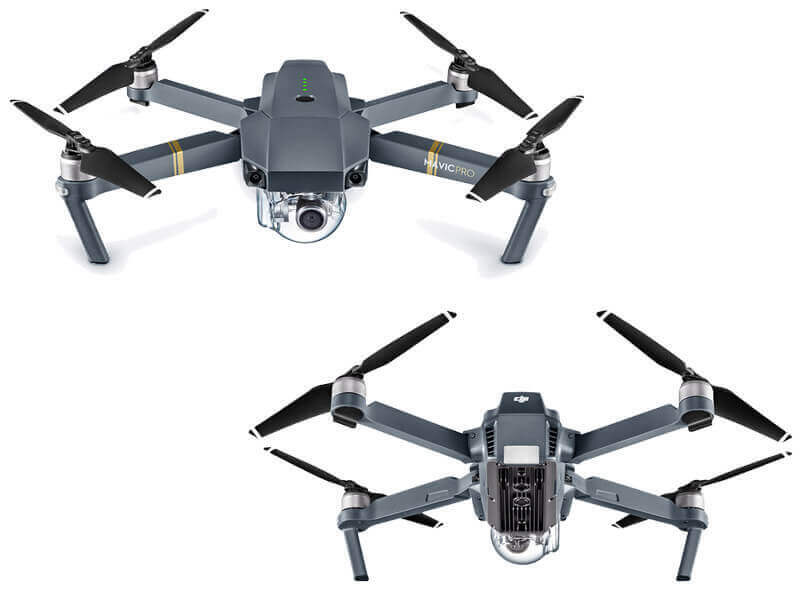 The Mavic Pro is the first foldable drone from DJI and while it is far smaller than some of its predecessors, it has retained almost all of their key features. 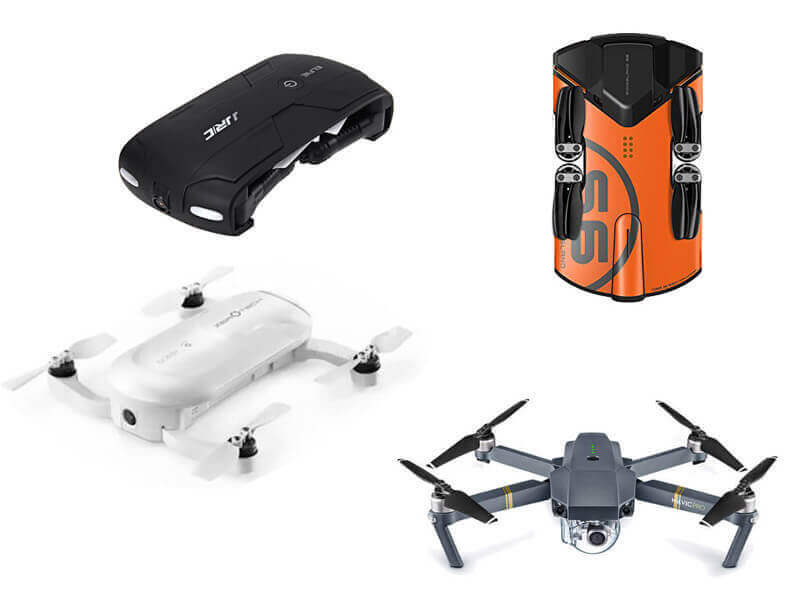 This is the most expensive selfie drone on this list but is also by far the most advanced and versatile quadcopter of the lot. Featuring a gray and gold color scheme, this quadcopter has been said to be the “the sports car of the drone world” with enhanced maneuverability and portability. In terms of still photography and selfies, the Mavic can perform single shots and burst shooting at 3/5/7 frames. This quadcopter also features Auto Exposure Bracketing (AEB) with 3/5 frames at 0.7, EV Bias and Interval Still Photography Modes. For Video Recording Modes, the camera can shoot C4K, 4K, 2.7K, FULL HD and HD. The remote controller is also completely new. It is entirely foldable and therefore follows suit in terms of portability. The arms extend outward and can then support your mobile device. Your device’s screen will give you the real-time video downlink from the quadcopter while the smaller built–in screen on the controller will give you flight-critical data such as altitudes and wind speeds. The controller and video transmission can operate effectively to a distance of approximately 4.3 miles (7km) from the drone, placing it well ahead of the other selfie drones featured here. With the Mavic, you could perform a ‘dronie’ that zooms out to a distance of 4.3 miles while still receiving a 720P real-time video on your device. The Mavic Pro is an excellent drone for selfies. It is definitely the most qualified to take all sorts of selfies and to take them in the best quality of all the selfie drones listed in this review. It won’t, however, fit into your pocket and is, therefore, less portable than some of the smaller challengers. It has a hefty price tag and this means increased risk when flying. If you’re looking for a cheap and cheerful quad to play around with and take a few dronies, then this isn’t the drone for you. 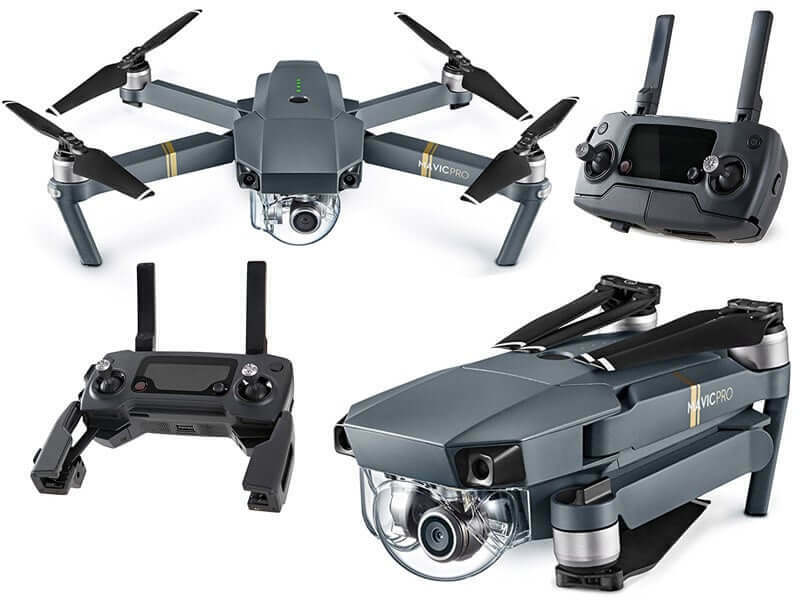 If you are looking for a titan of the drone world which can take some of the highest quality selfies, photographs, and videos, while offering a myriad of versatile features, then this is precisely what you are looking for. 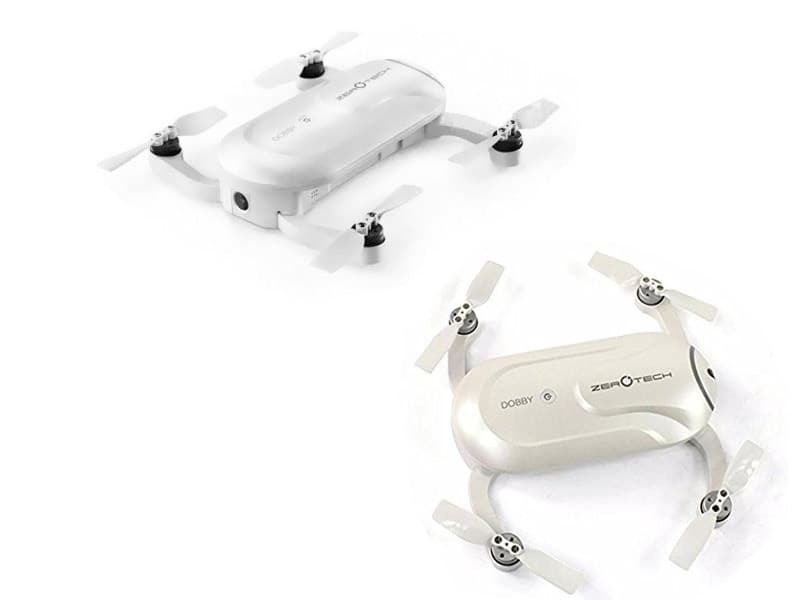 The Dobby pocket selfie drone is white in color, featuring a clean, minimalist design. It looks like something out of a science fiction movie and packs a major punch for its size. This quadcopter hasn’t been designed for lengthy expeditions, instead, it is a perfect solution for those who wish to quickly capture high-quality photos and videos of themselves, their families and activities. The Dobby quadcopter is a bit spicier on the price tag than the JJRC and the EACHINE selfie drones but offers more features and higher image quality. The entire pocket drone weighs in at less than half a pound and is fully controllable from your smartphone via the ‘do.fun’ app which is Android and iOS compatible. This quadcopter has 9GB of internal storage with no SD card, this means that the photos and videos are recorded and stored internally and do not have to be stored on your smartphone. A micro-USB port allows you to easily download your content from the drone to your laptop or another device. An optical sensor allows the quadcopter to track its position for safe flight indoors. An acoustic sensor aids the quadcopter in performing gentle landings. Dobby incorporates advanced features such as tracking the user and keeping them in the shot while recording. The Drone also has a “short video” mode in which you can take a 10-second dronie of you while zooming out from your location. The ZEROTECH Dobby Pocket Selfie Drone is definitely one of the best small selfie quadcopter available on the market. The video quality might not be 4K but is none the less, very good, especially compared to some of the slightly less expensive quadcopters. The flight time is quite short and this is probably the biggest downfall. The portability included sensors and versatile features are a plus. In conclusion, if you’re looking for a small drone with excellent image/video quality for short, spontaneous captures then ZEROTECH Dobby Pocket Selfie Drone is the best choice for you. The EACHINE E50 is a portable folding quadcopter. 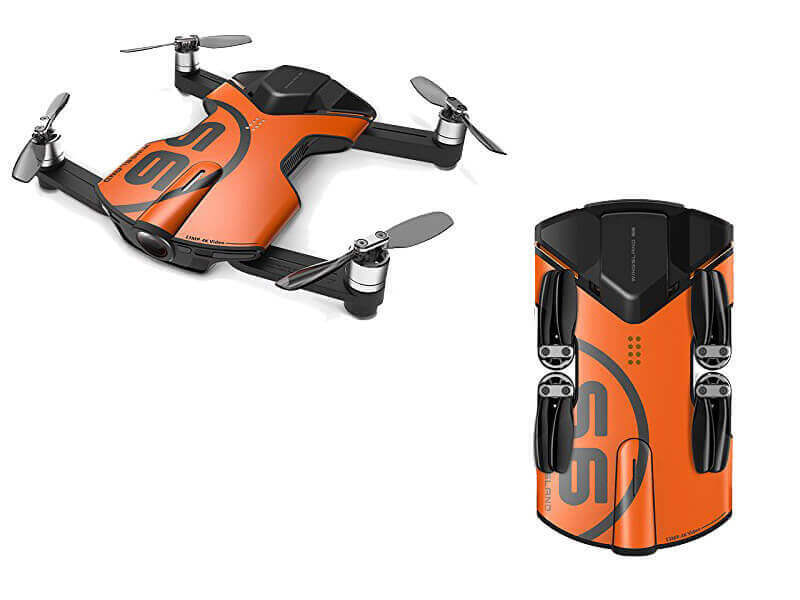 The quadcopters wings can be folded inwards alongside the body, making one small unit about the size of a smartphone. It is one of the most affordable selfie camera drones on the market and is very similar to JJRC quadcopter. The E50 comes in white and is accompanied by a small velvet carrying case which is great for protecting those important propellers when sliding it in and out of your pocket. Yes, it will fit into your pocket, meaning you can keep it with you at all times to get that perfect shot. You will need to download the WiFi FPV or WiFi UFO app to your smartphone, this is freely available on both, Google Play and the App Store and is compatible with Android and Apple devices. You can choose to fly your quadcopter via the G-Sensor control by tilting the phone or using the virtual joysticks on-screen. This will give you full control of your E50 as well as the ability to view exactly what the quadcopter is capturing via a real-time video downlink. You can also store the pictures and the videos that you take onto your smartphone. The camera on the front end can be manually adjusted to face upwards or downwards. This drone also features an altitude hold function and built-in barometer, allowing you to take effortless selfies. The EACHINE E50 is an excellent budget selfie drone. It does not perform well at distance but in close proximity, it is sufficient and an inexpensive way to get going with a drone and take some cool selfies or dronies. Charging the drone quad may take you a while but the collapsible limbs make this a true pocket drone. And with that, Eachine E50 WIFI FPV Quadcopter concludes our Top 5 Best selfie Drones. We hope you enjoyed.